At SabbaShop, we provide a continuous flow of awesome deals. Since 2004, our loyal customers keep coming back for the HUGE discounts, wide product variety & fast, friendly service. New auctions are added daily - always with no reserve. Bargain hunters are always looking for new ways to purchase away from the usual suspects: the malls or big box stores. Sabbashop customers enjoy big savings with our online auctions, fixed price deals, and very popular In-Store Clearance. Our dedicated customer service has earned us a 99.7% positive rating (on eBay). In today’s world, we are all looking for ways to save money and stretch our dollars further. Get what you need AND want, and have fun doing it... Shop SabbaShop! You can purchase on SabbaShop.com, our eBay store, Amazon store, or In-Store Clearance. 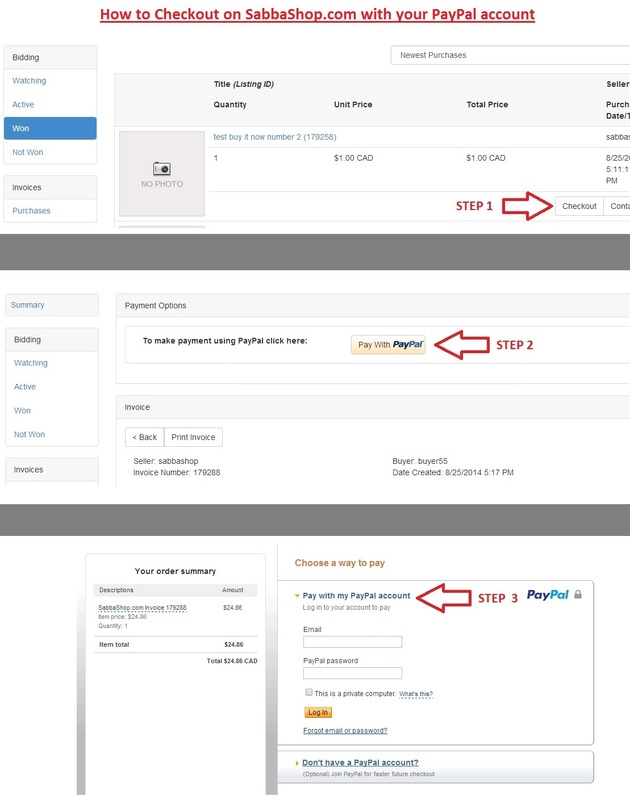 In order to bid on SabbaShop.com you must be registered and logged in with your username and password. You must be at least 18 years old, and it's free to register. To buy on our eBay or Amazon stores you must be registered on those sites. The auction bidding process works the same for both SabbaShop.com and our eBay store. We will bid incrementally for you up to your maximum bid. Your maximum bid is kept a secret from other users. Your bid is a contract between buyer and seller. If you have the highest bid you will enter into a legally binding purchase contract. Amazon payments Only for Amazon Store purchases. All Amazon purchases must be paid on Amazon and shipped. No local pick up or payments allowed. Taxes are charged according to province. ONT, NB & NF pay 13% HST. NS pays 15% HST. PEI pays 14% HST. All other provinces pay 5% GST. Taxes will be added to item cost,shipping and handling charges in accordance with Ministry guidelines. All items must be paid within a maximum of 25 days from the purchase date. Paid orders will be held for a maximum of 45 days FROM PURCHASE DATE. Orders are shipped within 2 business days of receiving cleared payment. You will be sent an email once your order has been shipped. Insurance for full purchase price included with purchase. Estimated transit time for CANADA: UPS Standard 2 - 5 business days. Canadapost Expidited 3 – 7 business days. Estimated transit time for USA: UPS Standard 4 - 7 business days. Canadapost Expidited 5 – 9 business days. We respond to emails Monday to Thursday from 10am to 6pm, and Fridays from 10am to 5pm. We usually do not answer emails on weekends, as our families would be quite upset with us if we did! SabbaShop employs over 20 people who work very hard to individually test & inspect items, inventory items, ship product out, and provide service with a smile at local pick up. Rest assured if there is ever an issue it will promptly be resolved by our customer service staff. We hope you enjoy shopping with us ! SabbaShop is a liquidator which is not affiliated with the manufacturers. As such, some companies will not honour the manufacturer warranty. However, SabbaShop does offer a 30 day return policy, as stated in the "Refunds and Returns" section above.